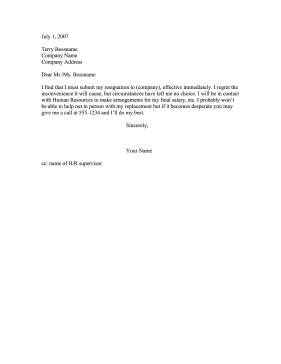 This resignation letter requests departure without notice or explanation. I find that I must submit my resignation to (company), effective immediately. I regret the inconvenience it will cause, but circumstances have left me no choice. I will be in contact with Human Resources to make arrangements for my final salary, etc. I probably won't be able to help out in person with my replacement but if it becomes desperate you may give me a call at 555-1234 and I'll do my best.